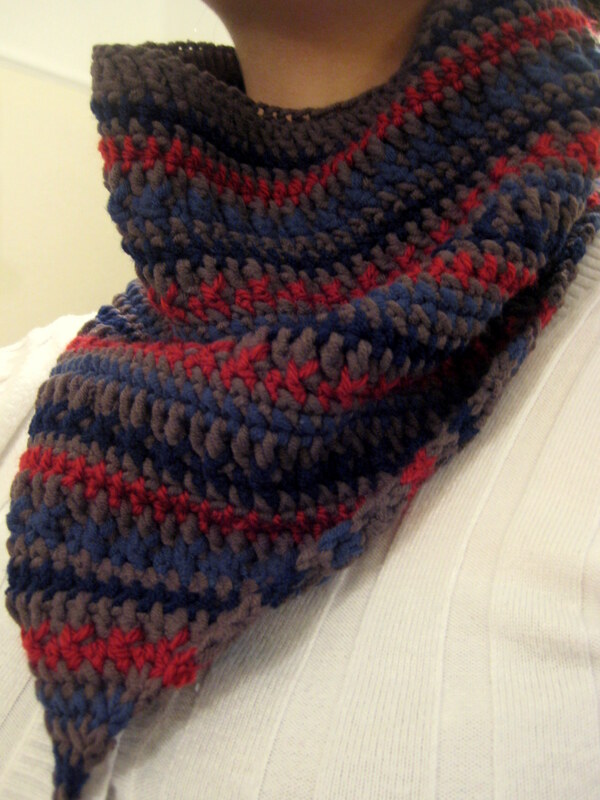 I’ve made a few of these multi-yarn cowls recently so wanted to go for something a bit different. I made this as a Christmas gift for my brother (who writes awesome music, check it out on youtube here). 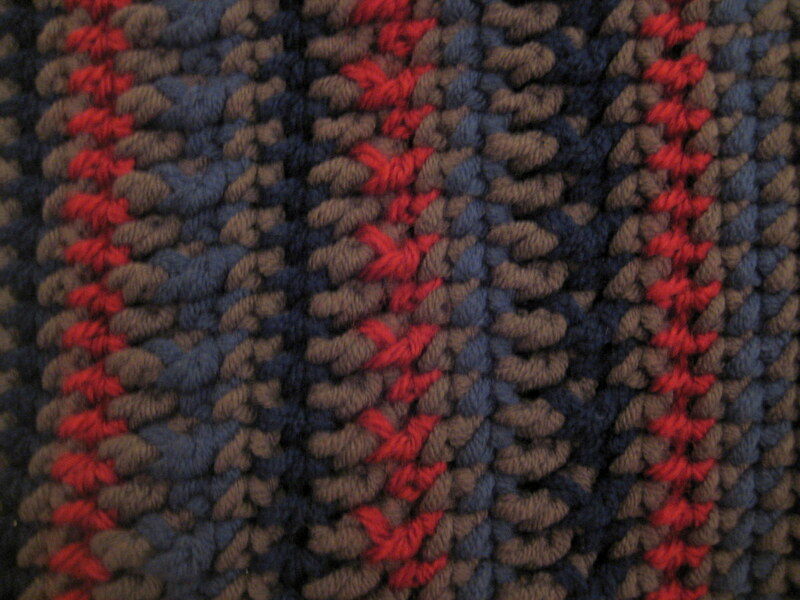 I like the texture of the post stitches and the colour combination. 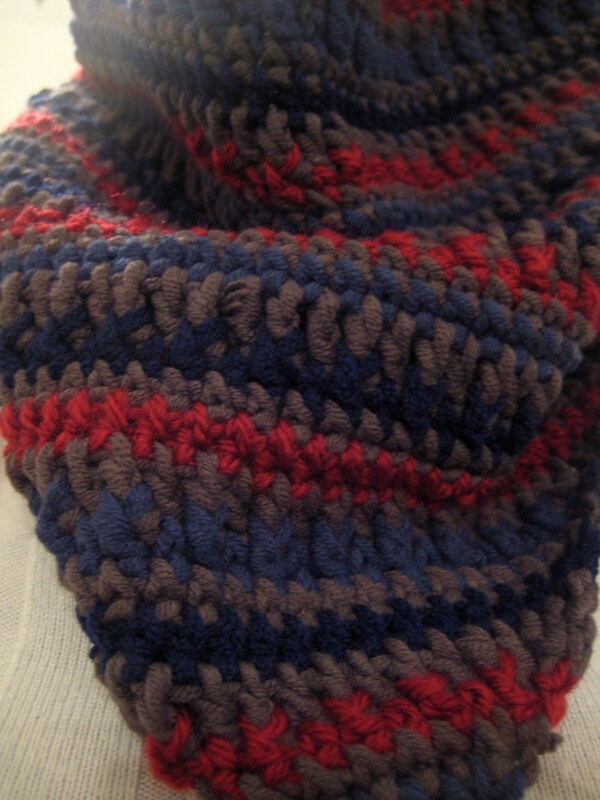 The pattern starts off in the round and is then worked in rows, decreasing stitches to make the triangular point. I changed colour each row to show off the stitch pattern a little better. This meant quite a few ends to weave in but I think the effect was worth it! You will need less than 1 skein of each of 4 colours of yarn to make a similar scarf, or around 400m total. I used a 5mm hook to match my fattest yarn (the grey background colour); if you want to use smaller just increase the starting chain length. Tip: when starting a new round/row, crochet over the ends to save weaving in later. Starting with the background colour (grey), chain 85, join with a slip stitch into 1st loop, making sure the chain is not twisted. Round 1: Chain 2, dc into each chain around, join with a slip st (85 sts). Fasten off and join next colour. Round 2: ch2, hdc into each st around (85 sts). Fasten off and join background colour. Round 3: ch2, sc into each st around (85 sts). Fasten off and join next colour. Round 5: ch2, dc into each st around (85 sts). Fasten off and join next colour. Round 6: ch1, *sc into next st, fpdc about the next post of the dc in the row below, repeat from * to end and join with a sl-st (85 sts). Fasten off and join background colour. Row 7: ch1, sc2tog, sc into each st around until 2 sts remain, sc2tog (83 sts). Fasten off and join next colour. Row 8: ch 2, hdc2tog, hdc into each st around until 2 sts remain, hdc2tog (81 sts). Fasten off and join background colour. Row 9: ch2, dc2tog, dc2tog, dc into each st around until 4 sts remain, dc2tog, dc2tog (77 sts). Fasten off and join next colour. Row 10: ch1, sc2tog, *sc into next st, fpdc about the next post of the dc in the row below, repeat from * to 2 sts remaining, sc2tog (75 sts). Fasten off and join background colour. Final Row: Join colour and ch 1, sc2tog. Fasten off and weave in all ends. Block as desired.